Set in a quiet residential area, this villa to rent in Sueno Azul, Tenerife has its own private pool set in beautiful established gardens with leafy palms and flowering shrubs. 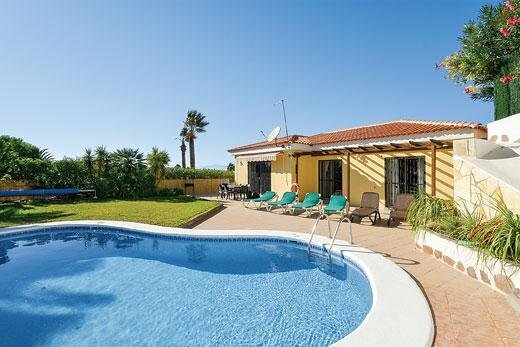 This lovely Tenerife villa is in the prestigious area of Sueno Azul, Callao Salvaje - a small, yet popular resort on the west coast of the island, a ten minute drive from lively Playa de las Americas. A unique Tenerife villa to rent, it is situated nice and privately on a corner plot and benefits from a pretty kidney shaped pool area. The pool is heated from 1st November until 30th April There is also wi fi at the villa. A lovely Tenerife villa to rent, it is set in the picturesque resort of Callao Salvaje, a ten minute drive to the north of Playa de las Americas on the west coast of Tenerife. Once a quiet fishing village, the resort has blossomed in recent years and is becoming a very popular low key resort. Dotted arond the resort are several bars and quality restaurants and the resort centre has even more - catering for a variety of taste. Sueno Azul is a beautiful area of Callao Salvaje and this Tenerife villa offers a lovely position within it. It is just a short stroll to the resort centre but there are some local shops too - including a lovely French bakery for your Croissants or bread in the morning!! The villa is within walking distance of the sea front where there is a small beach with a mixture of shingle and black sand. The bright lights and beach activity of Playa de las Americas is close, and closer still are the stunning sandy beaches at Fañabe. Callao Salvaje is ideally situated to explore the island, as the motorway network which links the island is close by - whether you want to head north to the Tiede National park, or head to the busy resorts of the south. For golf lovers, the nearest course is at Costa Adeje, at just a 5 minute drive away. The open plan living space of this Tenerife Villa is bright and airy with comfortable seating for six people and large patio doors giving easy access to the pool terrace and outdoor dining area. The living room is equipped with a television which has some satellite channels and a DVD player, as well as a CD stereo. Near to the open plan kitchen area is a circular dining table with four chairs, and there is a large breakfast bar with bar stools. The kitchen has a dishwasher, microwave, a large fridge / freezer and a new American style oven and hob. The master has an en-suite with a bath/overhead shower, washbasin and WC. Patio doors open to the lovely gardens and pool. The two other bedrooms have twin beds and share the separate bathroom with shower. There is a patio set for outdoor dining which is sheltered by a retractable canopy, and sun-loungers on the terrace for those who enjoy sun bathing. There is a portable barbecue for al fresco dining in the warm summer evenings. 2 large sofas, dining room table and chairs, satellite television, DVD player and patio doors opening ton the pool area and lovely gardens. Spacious bedroom with double bed, patio doors to pool area and ensutie bathroom with WC, bath and shower. Twin beds and patio doors to pool area . Bedroom two and three share a communal bathroom with shower. Heated in the winter months. 25 minutes from Airport, 10 minutes to Playa de Las Americas (by car).